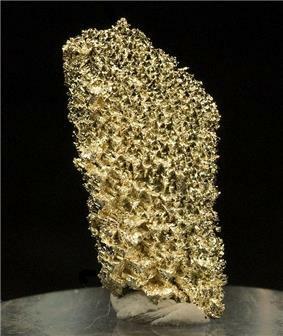 Crystalline gold specimen from the Dixie mine, Lamartine District, SW of Idaho Springs, Colorado. Size: 1.8 x 0.9 x 0.2 cm. The median income for a household in the county was $50,997, and the median income for a family was $61,400. Males had a median income of $41,667 versus $30,757 for females. The per capita income for the county was $28,160. About 3.00% of families and 5.40% of the population were below the poverty line, including 6.80% of those under age 18 and 5.60% of those age 65 or over. In the county the population was spread out with 22.60% under the age of 18, 5.60% from 18 to 24, 32.60% from 25 to 44, 32.20% from 45 to 64, and 7.10% who were 65 years of age or older. The median age was 40 years. For every 100 females there were 108.80 males. For every 100 females age 18 and over, there were 110.20 males. There were 4,019 households out of which 28.20% had children under the age of 18 living with them, 54.60% were married couples living together, 6.90% had a female householder with no husband present, and 35.10% were non-families. 27.20% of all households were made up of individuals and 4.30% had someone living alone who was 65 years of age or older. The average household size was 2.31 and the average family size was 2.81. As of the census of 2000, there were 9,322 people, 4,019 households, and 2,608 families residing in the county. The population density was 24 people per square mile (9/km²). There were 5,128 housing units at an average density of 13 per square mile (5/km²). The racial makeup of the county was 96.37% White, 0.28% Black or African American, 0.73% Native American, 0.36% Asian, 0.03% Pacific Islander, 1.02% from other races, and 1.20% from two or more races. 3.87% of the population were Hispanic or Latino of any race. Clear Creek County tends to be somewhat divided between Republicans and Democrats. In the 2012 election Barack Obama won over Mitt Romney 54% to 42%. According to the U.S. Census Bureau, the county has a total area of 396 square miles (1,030 km2), of which 395 square miles (1,020 km2) is land and 1.3 square miles (3.4 km2) (0.3%) is water. Clear Creek County was one of the original 17 counties created by the Colorado legislature on 1 November 1861, and is one of only two counties (along with Georgetown in 1867. 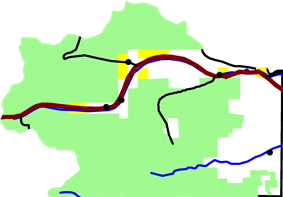 Clear Creek County is part of the Denver-Aurora-Lakewood, CO Metropolitan Statistical Area.